Gary Fallesen lives on the shore of Lake Ontario in suburban Rochester, New York, at an elevation of 250 feet, which means when he climbs mountains such as 19,340-foot Kilimanjaro in Tanzania, Africa, or 14,494-goot Whitney in California, he is starting from nearly ground zero. A life-long outdoor enthusiast, he took up climbing Mount Rainier in Washington in 1996, the same year he became the Outdoor writer at the Rochester Democrat and Chronicle newspaper. The older of Mary Lou and Karl David Fallesen's two boys, Fallesen began with the Democrat and Chronicle in 1979 while a junior at St. John Fisher College in Pittsford, New York. He has won numerous local, state and national awards over two decades as a high school writer, a college writer, a columnist and the Outdoor writer. His writing has also appeared in various national publications. 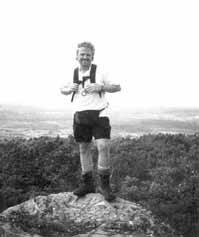 His newspaper story on Sue and Rich Freeman 1996 breakaway-from-the-workaday-world thru-hike of the 2,200-mile hike of the Appalachian Trail introduced him to the couple that would be his publishers. He is a member of several outdoor organizations, including the American Alpine Club and Adirondack Mountain Club, and has been recognized in six different Who's Who titles, Who's Who in America 2000 among them. Fallesen, who graduated from Greece Acadian High School in 1977, married Elaine Busse in 1982. They have two children -- Jesse Dane, who was born in 1989, and Hayley Hope, born in 1994. When he isn't outdoors, Fallesen usually can be found singing or directing drama at his church, Hope Lutheran in Greece, New York.